Procter & Gamble Japan K.K. KOBE, Japan, April 8, 2019 /PRNewswire/ -- Pantene Japan, a hair-care brand of Procter & Gamble (P&G) Japan, launched the "#HairWeGo What's Wrong With My Hair" campaign. The campaign, launched on the social media, radio, video (YouTube) and newspaper advertising, calls for social dialogue around hairstyle rules in Japanese schools, which include requiring students to keep hair in low ponytails and dye their naturally brown hair black, limiting allowed styles of haircuts, requiring proof of natural hair color and more. Representing a miniature vision of the campaign's goal, Pantene Japan created a rare opportunity for dialogue between students and teachers who have experience with Natural Hair Certificates by gathering them in a video revealed on April 8, 2019 (https://www.youtube.com/watch?v=ILNVgpCltuw). The filming provided a place to open up and share honest opinions about hair-related school rules: the questions that students never had a chance to ask, the thoughts that teachers never shared. 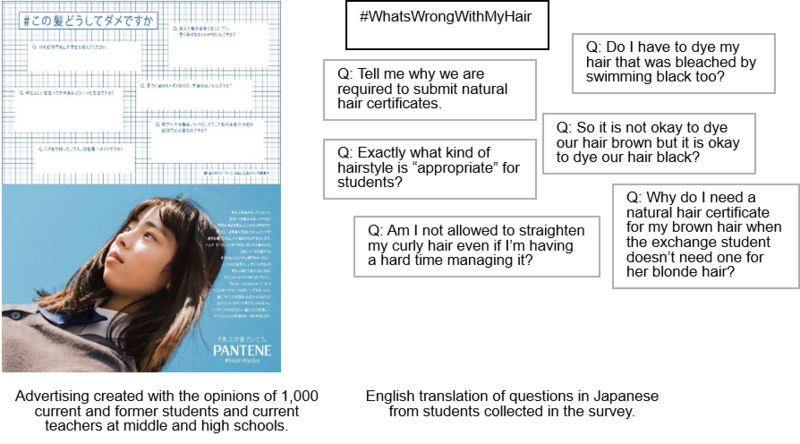 In connection with the campaign, part of the "HairWeGo My Hair Moves Me Forward" series, Pantene Japan surveyed 1,000 current and former students and current teachers at middle and high schools and found that a majority on both sides have doubts about hairstyle rules. As many as one in 13 current and former middle and high school students said they "have been urged to dye their naturally brown hair black," and 70 percent of teachers "have doubts" about hairstyle rules at their school. Yet, over 90 percent of students had never heard the reasons for these rules. "News of high school students being forced to dye their hair black provided the inspiration for this campaign," explains Yoshiaki Okura, Regional Associate Brand Director, Hair Care Focused Market, at Procter & Gamble. "Hair represents one's individuality, both chosen and innate. Overly strict school rules are restricting both types and no one seems to understand why," comments Okura. "School should be a place to find one's individuality, which leads to self-confidence that carries students through their life. This is why this issue really struck a chord. Individuality and confidence are also key elements of Pantene Japan's brand philosophy, 'My hair moves me forward.' We hope that the '#HairWeGo What's Wrong With My Hair' campaign will bring attention to this issue, and provide a catalyst for dialogue that will help create a society where students are respected as individuals." Respondents: Current middle and high school students 12 to 18 years old (including proxy answers), former middle and high school students 20 to 69 years old (graduated from high school), current middle and high school teachers 23 to 69 years old, both male and female. #HairWeGo My Hair Moves Me Forward: "My hair moves me forward"
After its creation in 1945, haircare brand Pantene has been embraced by women the world round. Pantene aims to be a brand that constantly encourages growth under its brand philosophy "My hair moves me forward." SOURCE Procter & Gamble Japan K.K.